Following on from the forty days of Lent, we begin the Easter Triduum on the evening of Maundy (Holy) Thursday (18 April 2019). The word Triduum comes from the Latin meaning three days and during this time we commemorate the events that lie at the heart of our faith; the institution of the Eucharist, the passion, the crucifixion and death of our Lord, his descent to the dead, and finally his glorious resurrection on Easter Sunday morning. It includes the Easter Vigil, the high point of the Triduum and it ends on the evening of Easter Day (21 April 2019). What happens on Maundy Thursday? The word Maundy comes from the Latin ‘mandatum novum’ that refers to Christ’s new commandment (John 13:34), given at the Last Supper, to ‘love one another as I have loved you’. There is only one Eucharist allowed in Parish churches on this day and it has to be in the evening: ‘on the night that he was betrayed’. On this day we commemorate the institution of the Eucharist at the Last Supper and so the celebration of the sacrament takes on special significance. It is the sacrament of sacraments. But in addition the service has three other symbolic actions which commemorate Christ’s passion; the Washing of the Feet, the Procession to the Altar of Repose and the Stripping of the Altars. The liturgical colour is white in celebration and the service starts joyfully with a procession of the Holy Oils blessed that morning, and ringing of bells at the ‘Gloria’. From that moment all bells in the church are silenced until they are rung again at the Vigil on Easter Day to celebrate Christ’s resurrection. The tabernacle is empty, the reserved sacrament having been removed as Christ will be taken from us. The holy water stoups have also been emptied, to be refilled with the water blessed at the font on Easter morning. During the ceremony of Washing of the Feet, which follows the sermon, the priest washes the feet of 12 members of the congregation whilst the choir sing ‘Ubi Caritas’ – ‘Where true love is, God is there’ from the Latin liturgy for Maundy Thursday. It is a symbolic commemoration of Christ’s action when he washed his disciples’ feet, showing his love for them and commanding them to show the same love for each other. It vividly illustrates the humility that is the Christian mandate. At Holy Communion, celebrated with full choral accompaniment, the words of the Eucharistic prayer are changed to reinforce for us that this is the night of the Last Supper, with the priest saying: ‘who on this night was betrayed. There then follows the Procession of the Blessed Sacrament to the Altar of Repose. It recalls that after supper Jesus left the Upper Room and went with the apostles to the Garden of Gethsemane. The Sacrament is carried round the church preceded by incense and lights to the side chapel, which is richly decorated with flowers, and candles to become our ‘Garden of Gethsemane’. There the Blessed Sacrament is ‘reposed’ and adored whilst the choir sing the traditional 13th Century St Thomas Aquinas hymn, ‘Pange Lingua’ – ‘Of the glorious body telling’. We recall Jesus’ agony in the garden and we seek by prayer to experience Jesus’ presence with us. . The priests and servers then process out and return to the church, dressed solely in black, to take away all the church plate and furnishings, stripping the sanctuary completely bare. This symbolises the nakedness of Christ as he was stripped for his crucifixion, not to be dressed again until the morning of his Resurrection. During this Stripping of the Altars the choir sings Psalm 22 – ‘My God, My God, why have you forsaken me’? It presents a very stark contrast to the beauty of the ‘garden’. 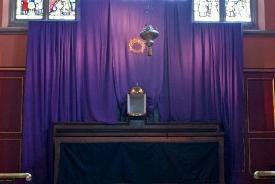 Once the service has ended there is a Watch at the Altar of Repose, in the side chapel, until midnight. It is a time when members of the congregation are invited to come and pray in silence for as long as they wish. Some return later to spend time in quiet before the Sacrament. At 11.45pm the service of Compline is sung, the candles are all extinguished, the priest seizes the Sacrament and rushes off with it, symbolising Christ’s betrayal and arrest. The St Michael’s Maundy Thursday service is full of symbolism and is a deeply moving liturgy. It helps us to enter into the mystery of the Passion in a way that cannot be grasped by simply reading the words in a book. You will miss something very special if you are not present at this service – no-one can fail to be moved by it. This is the day when we remember the desolation of Christ’s crucifixion and death. We gather in a church stripped of all its usual decoration, just as Christ was stripped of all his garments. It is the most solemn day of the Church’s year and one of obligation for all practising Christians. In recalling Christ’s sacrificial offering for ‘the sins of the whole world’ we reflect on our own sinfulness and the challenge of the cross in our modern world. 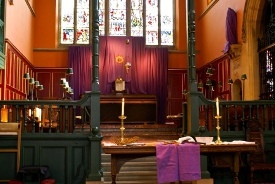 There are 3 services at St Michael’s on Good Friday (19 April 2019) with a Children’s Passion at 12 noon and Stations of the Cross at 1pm. The main service takes place at 2pm, ‘The Holy Liturgy of the Lord’s Passion’. This service has four parts – it begins with a silent procession into the church and the prostration of the priests before the Altar. The liturgical colour is red symbolising Christ’s blood, shed for us. The Liturgy of the Word follows, the central part of which is a sung narration of the Passion according to John that vividly relates Christ’s crucifixion and death as described in St John’s Gospel. We then join in intercession for the needs of the church and the world in the words of the ancient Solemn Prayers which have been prayed throughout the centuries. The most symbolic moment of the service comes in the Proclamation of the Cross. The cross that normally stands at the top of the chancel steps is processed through the body of the people and set up before them for silent reflection. Members of the congregation are invited to come up and venerate the cross by kneeling at its foot and kissing it.This is an act of faith in Christ and one of gratitude, penitence and love. The service ends with Holy Communion. Traditionally the Eucharist is not celebrated on this day but Communion is given in one kind only (the holy bread) from the Sacrament consecrated the previous day, Maundy Thursday. This simple service in a ‘naked’ church conducted with deep solemnity and with its very beautiful choral accompaniment takes us to the heart of the most desolate moments of the Christian faith. Again it helps us to engage with the Passion of Christ in a way that words alone simply cannot express. It is impossible to leave this service without a feeling of deep spiritual sadness. Following the Good Friday services we have the interlude of Holy Saturday when Christ descended to the dead. During this time St Michael’s prepares for the glorious celebrations of His Resurrection. The church becomes a hive of activity as all its furnishings and fabric are refurbished and restored, and it is dressed with a profusion of flowers ready for the first service of Easter, the next morning. What happens on Easter Day? This is the day on which we celebrate the Resurrection of our Lord. It is the Feast of Feasts, the blessed night when Christ is risen from the dead and opens for us the hope of eternal life. All our faith, our worship and our Christian profession take their meaning from this moment. 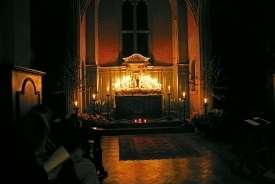 At St Michael’s, Easter Day (Sunday 21 April 2019) starts with the Vigil commencing before dawn (at 5am in 2019). The liturgical colour is gold and full lace is worn in celebration of this joyous day. The service begins in the dark on the grassy area outside the church where a bonfire has been lit. The sanctuary party process to the fire. One of the priests or the deacon carries the new Easter (Paschal) candle, a symbol of the Risen Christ in the world. He traces a cross on the candle, the Greek letters alpha and omega and the year – Christ is the beginning and the end, the Lord of all time and our time. Five incense grains are inserted as a symbol of the five wounds of Christ. The candle is then lit with fire from the brazier and processed into the church with the people following, lights for their candles being passed back from the Easter candle. 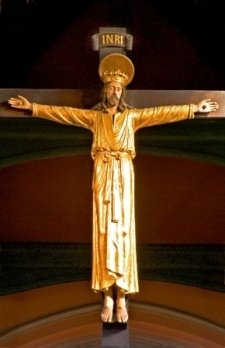 It is placed in its stand on the altar platform and the Easter proclamation is then sung. The High Altar candles are then lit in silence – a moment of expectation and anticipation – following which the priest intones ‘Glory be to God on High’ and suddenly the church is flooded with light, bells are rung, the organ swells and the ‘Gloria’ bursts forth in joyful thanksgiving. This is an unforgettable moment as our senses engage with the abrupt transition from darkness into light. It marks the beginning of the First Mass of Easter during which we are asked to renew our baptismal vows. In the early centuries baptism and Easter were closely linked and it was the only season when Baptism was regularly administered. The new converts entered sacramentally into Christ’s redeeming death and resurrection. In our service, after processing to the font at which the baptismal water is blessed and the Paschal candle immersed, the congregation repeat their baptismal vows and, whilst the choir sing the traditional Latin plainsong Vidi Aquam – ‘I saw water’, the people are then sprinkled with the water of baptism. The Choral Eucharist is celebrated at the High Altar, the reserve sacrament is returned to the tabernacle and the votive lights on the High Altar are rekindled. Christ is back amongst us. Finally we process out to a grand organ voluntary ready for the communal Parish breakfast which awaits us. Those who participate in this Vigil may receive Communion again at the second Mass of Easter Day which starts at 10am, which is a more family-orientated but equally joyful celebration of the Eucharist culminating in the distribution of Easter eggs and an egg rolling contest, commemorating the rolling of the stone away from the tomb, that tests the fielding skills of the Churchwardens! The momentous journey of Holy Week, through the initiation of the Eucharist and the other symbolic actions of Maundy Thursday, the desolation of Good Friday and the joyous celebration of the Easter Vigil come to a close on the evening of Easter Day with a quiet service of Evensong and Benediction at 6.30pm. To follow this journey at St Michael’s is a deeply moving experience, rich in symbolism, and one which informs and reinforces one’s faith like no other. No one who embarks on it will emerge unchanged.